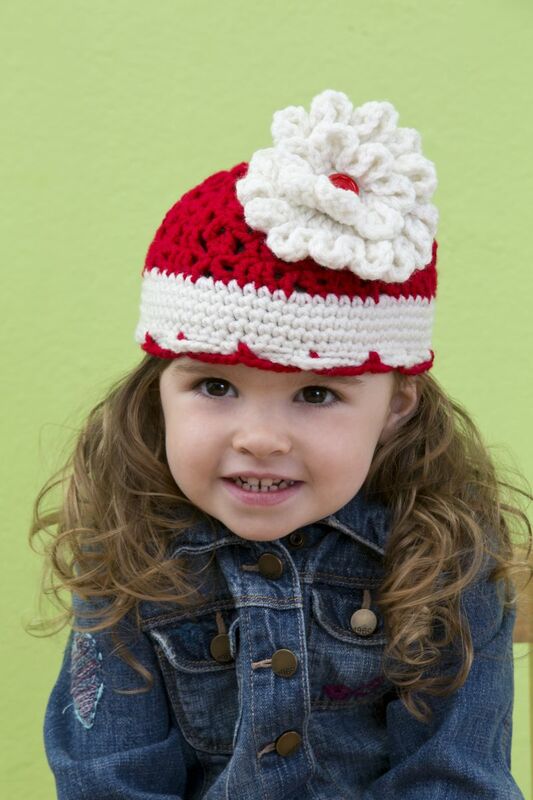 Create an absolutely adorable crochet Christmas project this year with the pattern for a Big Bloom Hat. This DIY fashion craft would make an excellent homemade Christmas gift for anyone needing a little warmth this holiday season. If you're a crochet crafter looking for your next project to get started on, this Christmas crochet pattern is just the thing. Pick some fun colors and really make this design pop. The big flower on top is the perfect touch to make a bold fashion statement. RED HEART® With Love™: 1 skein each 1909 Holly Berry A and 1101 Eggshell B.
Stitch marker, yarn needle, ¾" (19 mm) button. GAUGE: 15 sc = 4" (10 cm); 16 rows = 4" (10 cm). Rounds 1-3 = 3¾" (10 cm) in pattern. CHECK YOUR GAUGE. Use any size hook to obtain the gauge. (4 Medium) RED HEART® With Love™, Art. E400, available in solid color 7oz (198g), 390 yd (357m) and multicolor 5oz (141g), 230 yd (211m) skeins. V-stitch = (dc, ch 2, dc) in same st or space. CL (Cluster) = [yo and draw up a loop, yo and draw through 2 loops] 3 times in same space, yo and draw through all 4 loops on hook. Directions are for infant; changes for toddler and child are in parentheses. Hat circumference at bottom edge: 14 (16, 18)" [36, (41, 46) cm]. Round 1: With A, ch 6; join with slip st in first ch to form a ring; ch 3 (counts as dc), 14 dc in ring; join with slip st in top of ch-3 – 15 dc. Round 2: Ch 3, dc in next dc, V-st in next dc, [dc in next 2 dc, V-st in next dc] 4 times; join – 5 V-sts, 10 dc. Round 3: Ch 3, dc in next dc, * ch 2, CL in next ch-2 space, ch 2 **, dc in next 2 dc; repeat from * around, end at **; join – 5 CL, 10 dc. Round 4: Ch 3, dc in next st, * [ch 1, V-st in ch-2 space] twice, ch 1 **, dc in next 2 dc; repeat from * around, end at **; join. Round 5: Ch 3, dc in next dc, * ch 1, CL in ch-2 space, ch 1, 2 dc in ch-2 space, ch 1, CL in ch-2 space, ch 1 **, dc in next 2 dc; repeat from * around, end at **; join. Round 6: Ch 3, dc in next dc, * V-st in next CL **, dc in next 2 dc; repeat from * around, end at **; join. Round 7: Ch 3, dc in next dc, * ch 2, CL in next ch-2 space, ch 2 **, dc in next 2 dc; repeat from * around, end at **; join. Infant size only: fasten off. Toddler and Child Sizes Only-Round 8: Ch 3, (1, 2) dc in next dc, * V-st in next CL **, dc in next dc, (1, 2) dc in next dc; repeat from * around, end at **; join. Fasten off. All Sizes-Round 8 (9, 9): Join B in any st; ch 1, work 55 (60 , 70) sc evenly spaced around; join with a slip st in first sc. Rounds 9-13 (10-13, 10-13): Ch 1, sc in each sc around; join. Round 14: Ch 1, sc in first sc, ch 5, skip 4 sc; [sc in next sc, ch 5, skip 4 sc] 10 (11, 13) times; join. Fasten off. Round 15: Join A with sc in a skipped sc on Round 13 next to an sc of Round 14; * working BEHIND the ch-5 loop, ch 5, skip 4 sts (including a used st) **, sc in next sc in FRONT of ch-5 loop; repeat from * around, end at **; join. Fasten off. Round 1: With B, ch 6; join in first ch to form a ring; ch 1, 7 sc in ring; join with slip st in first sc – 7 sc. Round 3: (Ch 3, 4 tr, ch 3, slip st) all in first sc, * skip next sc **, (slip st, ch 3, 4 tr, ch 3, slip st) all in next sc; repeat from * around, end at ** – 7 petals. Fasten off. Round 1: With B, ch 6; join in first ch to form a ring; ch 3, 13 dc in ring; join with slip st in first dc – 14 dc. Round 2: Ch 3, dc in same st, 2 dc in each dc around; join – 28 dc. Round 3: Repeat Round 3 of Small Flower – 14 petals. Fasten off. Place small flower on top of large flower and secure with button. Sew onto hat with yarn needle and B.
Abbreviations: A, B = Color A, B; ch = chain; dc = double crochet; mm = millimeters; sc = single crochet; st(s) = stitch (es); tr = treble crochet; yo = yarn over; * or ** = repeat whatever follows the * or ** as indicated;  = work directions in brackets the number of times specified. 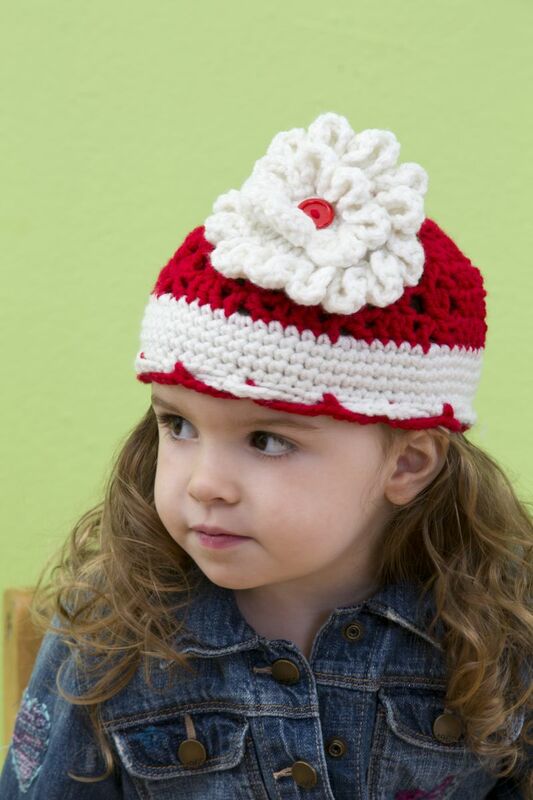 Find more craft projects and tutorials from Craft Company Red Heart Yarn. This pattern is on the Red Heart website. Directions are the same. There is something seriously wrong with this pattern, I thought I was going insane now I see the comments and know it's not ME YAY!!! Not really happy with this pattern. It has some major flaws. Love the pattern, but I'm stuck on row 3. After the first CL and ch 2; instructions say to dc in next 2 dc. Do you skip the next dc and go on to the ch 2 spc? Can any one help? I have ripped out stiches several times. There is a problem with row 5 of the hat. Could someone please check.